Garnier Pure Active 3 in 1 Wash, Scrub and Mask is by far one of the best products out there for oily skin right now. I am beyond elated that this product exists because my oily skin and I did not have a love-love relationship. I am glad to announce that that relationship no longer exists thanks to this miraculous product right here. From the smell, to the size, to the price, this product is ideal for anyone suffering from oily skin or skin generally prone to imperfections. Some of the most essential ingredients of the Garnier Pure Active 3 in 1 are the zinc derivative, pumice and white clay. Zinc might not be the first thing that pops to mind when you think of facial products and beautiful skin but I have learnt the astonishing benefits since using this product. Zinc is extremely useful for purifying the skin, reducing inflammation and it also acts as an anti-oxidant. Thanks to zinc being in this product my skin has since kissed impurities goodbye and looks radiantly clean. 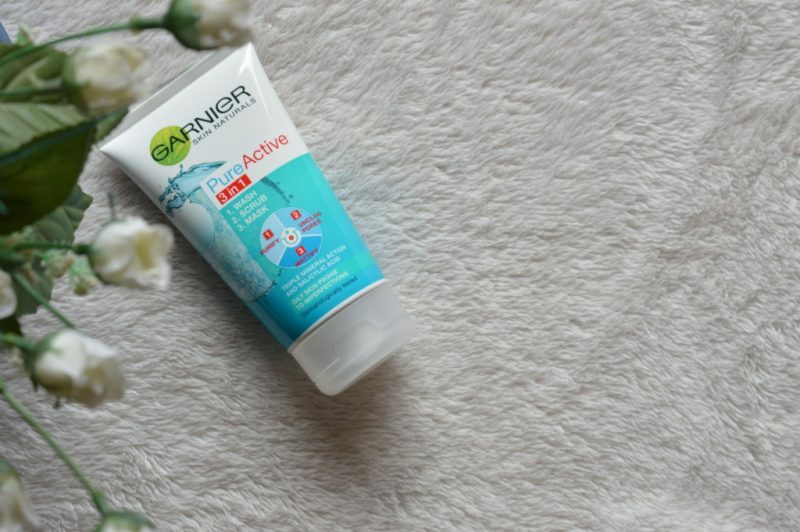 Pumice is great for getting rid of dead skin cells which I had quite a bit of around my t-zone before using Garnier, but that too has since been taken care of. The white clay is essential in giving you that matte look and helps absorb excess sebum. Say goodbye to blindingly shinny and oily skin. The Garnier Pure Active 3 in 1 comes in a healthy sized 150ml bottle. I used the product religiously twice a day and it still managed to last me quite a long time. It’s safe to say this bottle can easily last you an entire month depending on your skin care routine. As soon as you open the bottle you are hit with a refreshing, invigorating, cool and clean almost herbal-like, minty smell. It is not too strong however, and you have to hold the bottle quite close to your nose in order to smell it which is absolutely divine because no one wants to feel like they are rubbing perfume onto their face. Price and worth are two completely different things, but I am glad to say that this product is absolutely worth it. It is currently going for R97.99 in Spar right now but you can also find it in selected retailers and pharmacies which makes it super easy to get hold of. The real question is however, is it worth it? Of course it is! You are getting not one, not two, but three amazing products that work fantastically well and smell utterly incredible all for just that? And it lasts an entire month. I would say it is beyond worth it and is a great investment for one’s delicate and beautiful skin. No review is complete without cons, but I have to be truly honest. There isn’t a single thing I could find wrong with this product, and trust me I tried. It works exceptionally well, and coming from someone who has suffered from embarrassingly oily skin all their life this means a lot. For me personally the wash, scrub and mask all work amazingly well and come together very satisfactorily. All in all the Garnier Pure Active 3 in 1 Wash, Scrub and Mask is my new go-to product for my imperfections and oily skin. If you suffer from the same problems I do or just want to try the product out I would say absolutely go for it. Right now they have a 100% guaranteed money back offer. Buy it, try it, and if you don’t like it return it and get 100% of your money back (T & C’s apply). Go on, you have nothing to lose! Except for oily skin and imperfections of course. What is your favourite face wash, scrub or mask at the moment? Previous Post FASHION | Something Different, Something New. I remember my sister using this product at some point and it was bomb. Keen to try it out too. Have you tried it out yet babe? How has it treated you? I am all for natural facial care but the Freeman Range has won my heart over. I am currently using Lemon and Mint Clay mask, I have very sensitive skin and I tend to react to A LOT of products but so far so good with the freeman range. I last tried using Garnier when I was in high school but will bw sure to check this one out. Oh really? Will be sure to try the Freeman Range out, thanks! Where will I find it?